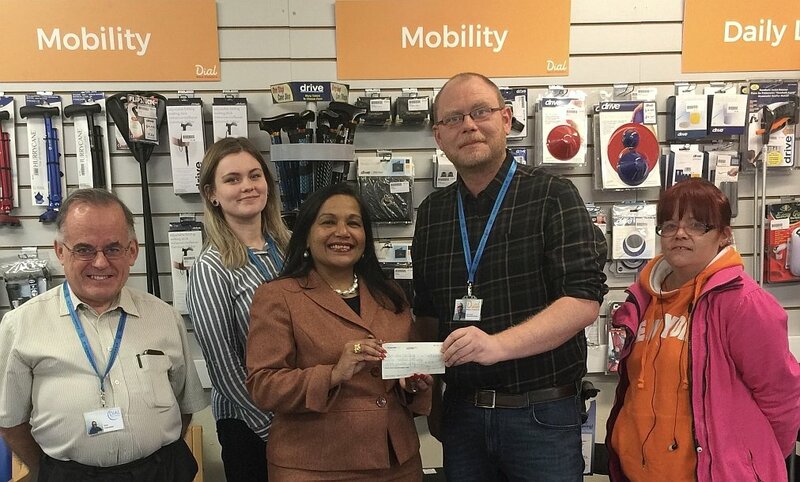 We welcomed Councillor Razia Daniels back to Chester Shopmobility last week. Councillor Daniels was Lord Mayor of Chester in 2017-18 and we were honoured that she very kindly chose us as one of the official Charities for her year in office. Our Shopmobility manager Richard together with volunteers Phil, Frankie and Nicky were thrilled to receive another cheque for money raised in this period. Very many thanks once more to Councillor Daniels for recognising the work Dial West Cheshire does. Our largely volunteer-led organisation relies heavily on kind donations like this to do the valuable work we do for disabled people in our community. We are always looking for more ways to work with organisations. If you think your organisation could offer support to our work, we would love to hear from you, please get in touch with our fundraising team to discuss how we could work together.